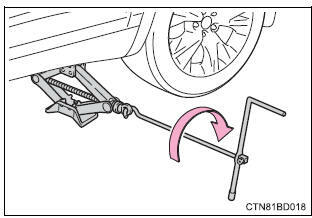 Turn the tire jack portion �a� by hand until the notch of the jack is in contact with the jack point. The jack point guides are located under the rocker panel. They indicate the jack point positions. 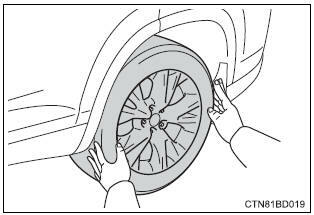 If the spare tire cannot be lowered, it may not have been stowed properly. 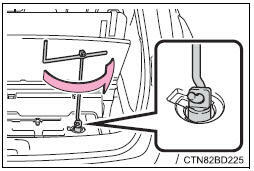 Fully tighten the spare tire clamp bolt by turning the jack handle clockwise until two clicks are heard and the jack handle skips. 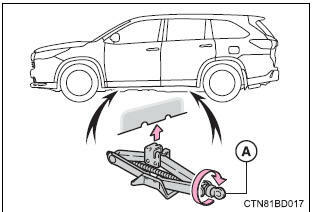 Turn the jack handle counterclockwise to lower the spare tire. 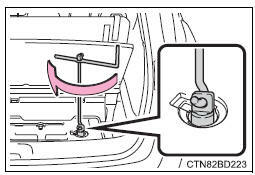 If the spare tire still cannot be lowered, attempt to fully tighten the spare tire clamp bolt again by turning the jack handle clockwise. 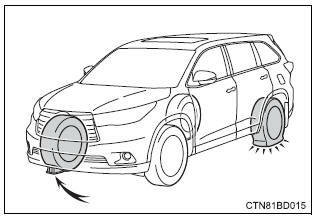 Then turn it counterclockwise at least 2 turns to lower the spare tire. 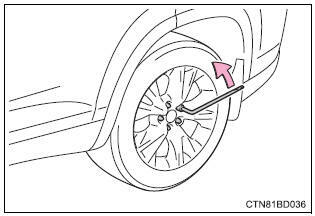 If the spare tire still cannot be lowered, the wire cable may be severed. have the wheel nuts tightened with a torque wrench to 76 ft¢elbf (103 n¢em.5 Kgf¢em) as soon as possible after changing wheels.